A traditional circa 1900 elm and beech chapel chair. These chairs have a slatted design with a useful bible box to rear. They have a shaped seat, and with their curved back supports, these chairs are extremely comfortable; ideal for cafes, restaurants, bistros etc. These chairs have been fitted with small pvc feet to prevent marks and dents on wooden floors. They are in good condition for their age, but you must appreciate, that as they are one hundred years old, they will have some signs of wear and tear. Please quote reference: SC025 St. Winnie's when enquiring. £15.00 delivery for a single chair to England and Wales. £25.00 delivery for 2 chairs to England and Wales. £55.00 delivery for a set of 4-6 chairs to England and Wales. 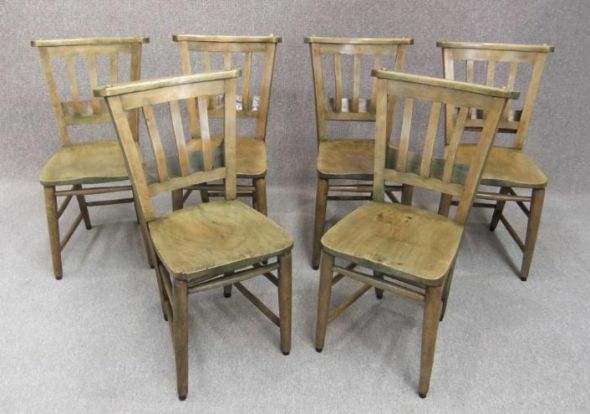 £65.00 for a set of 8 chairs to England and Wales. £75.00 for a set of 10 chairs to England and Wales.